High above Golden, Colorado in the foothills sits the historic Mount Vernon Country Club at 7600'. Besides its ideal location, the gem of this club for families is the swimming pool, which provides the perfect atmosphere to relax with family and friends. Chief Mountain is located west of Evergreen, Colorado, in the Arapaho National Forest. Chief Mountain Trail, approximately a two-mile hike (one-way), starts in a forest and summits at tundra, 11,700’ above sea level. With its pristine view, it is a secret hike for locals as the trail head is not promoted to tourists heading to Mount Evans along scenic Colorado Highway 103. Located at the west entrance to Rocky Mountain National Park is the quaint town of Grand Lake, Colorado. This charming town is more than a gateway to the national park, it is also boasts the largest and deepest natural lake in the state of Colorado, and if you are lucky, you'll spot a moose or two, which live in the area. It’s hard to find an activity that’s more idyllic than paddle boarding on Evergreen Lake in Evergreen, Colorado. Encircled by the Colorado foothills, it is the place to go if you are looking to spend a peaceful and serene afternoon. Whether you’re able to travel the globe paddling or can only dream of doing so through the windows of the internet, here is a list of ten blogs (in alphabetical order) you can enjoy exploring. All share their passion for the sport while bringing a unique spin to the activity. 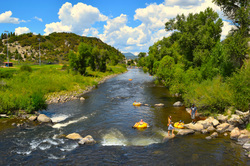 If you are visiting Steamboat Springs, Colorado during the summer, a must-do activity is tubing the Yampa River.